Have I told you lately how much I love a good hotel pool? 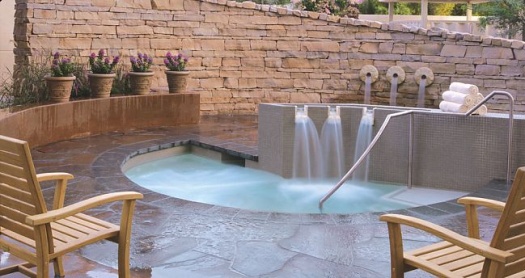 Well, I do and have I found a great place for fellow pool enthusiasts at the Renaissance Esmeralda in Indian Wells! 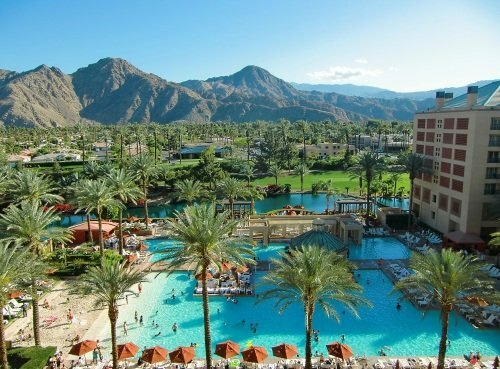 In addition to an awesome pool, this resort’s child-centric activities, a kids club, and family-friendly dining make it a spectacular choice for families headed to Palm Springs, California. The pool is the star at Renaissance Esmeralda. Hailing from San Diego, I am no stranger to the beach but as a parent of two young children, a day at this hotel pool was a relaxing alternative to the Pacific’s cold, crashing waves. The sandy beach provided plenty of fun for digging and sandcastle building. The zero-entry to the shallow pool made it possible for my 4-year-old to splash about and explore the pool a bit on his own (while sporting water wings) as I kept a vigilant watch from my beach towel on the man-made shore. Casual dining is available poolside too, so there is no need to get dried and dressed when it’s time for lunch. Servers deliver casual fare like salads, sandwiches, and icy drinks directly to your lounge chair. You may need to wait awhile, but where else do you have to be? 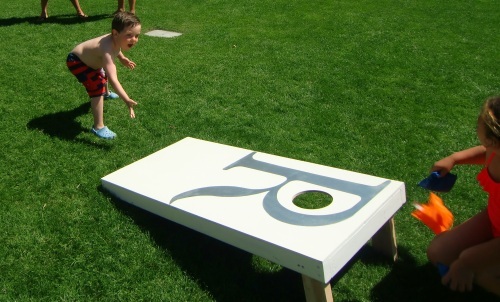 During the summer, spring break and winter holiday season, kids can participate in outdoor fun and crafts like coloring edible cookies, playing bean bag toss, Dive In Movies, treasure hunts, watermelon eating contests, kids’ dance parties, and face painting. A nominal fee is required for some of the activities. The Camp Oasis kids club (for ages 5 to 12) is open year-round but is based on occupancy. Children are kept busy with activities like sack races, hula hooping, and craft projects like painting on palm bark. They even get to mix up their own date shakes at snack time. Kids’ Night Out on Saturdays gives parents an opportunity to enjoy a little bit of romance on family vacation. There’s also plenty for the adults to do at this resort. The Spa Esmeralda is a glorious spot to forget your every day stresses while indulging in a relaxing massage, facial, body treatment or salon service. There’s also two golf courses, two tennis courts and a fitness center with a view of the fairway. In addition to the Pool Bar, there are four restaurants to choose from plus a coffee house at Renaissance Esmeralda. 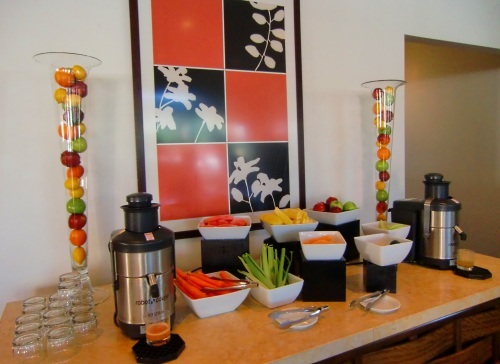 The bistro-style CAVA serves a spectacular brunch buffet with made-to-order omelets, yogurt parfaits, pastries, and a make-your-own juice bar. STIR Lounge is a laid-back spot in the center of the hotel where families are welcomed. If you’re too tuckered out from all of that fun in the sun, do as we did one night and order a full-sized pizza from room service and watch a family movie together in the comfort of your own room. The lazy days of summer make for great family travel time and Renaissance Esmeralda Resort & Spa has designed a package that includes activities for everyone to enjoy that won’t break the bank. This package is available from June 15 to September 1, 2012 with rates as low as $200 per night Sunday through Thursday and $300 per night Friday and Saturday including $100 resort credit. A minimum two night stay is required. 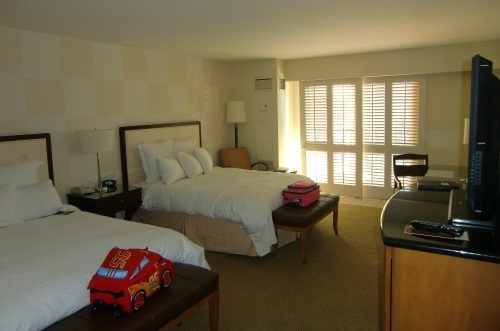 For reservations, please call (800) 321-1508 or visit www.marriott.com/pspsr and enter FML in the promo box. Sounds like a really sweet deal to me! 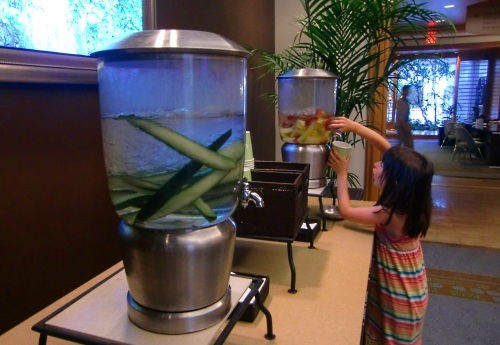 What do you look for in a family-friendly hotel? Let us know in the comments! 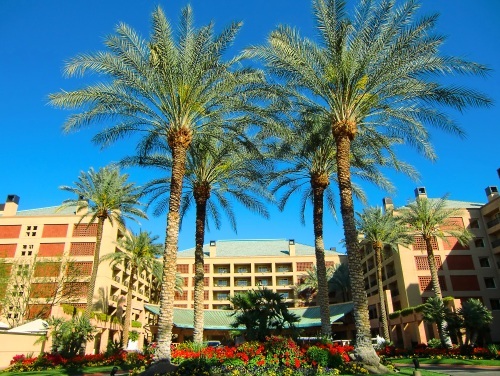 A Note from The Travel Mama: Thank you to Renaissance Esmeralda for hosting my family’s stay!